Call 586-286-4700 to Book a Golf Outing Today! Fern Hill is a par 70, 18 hole golf course. We can accommodate golf outings as well as men, women and couples golf leagues. For outings, we can host groups as large as 144 people. Whether you’re planning a casual day on the course with friends, a corporate golf outing, or a golf tournament fundraiser, Fern Hill can accommodate your needs. We offer golf outing packages to suit any occasion and almost every budget. 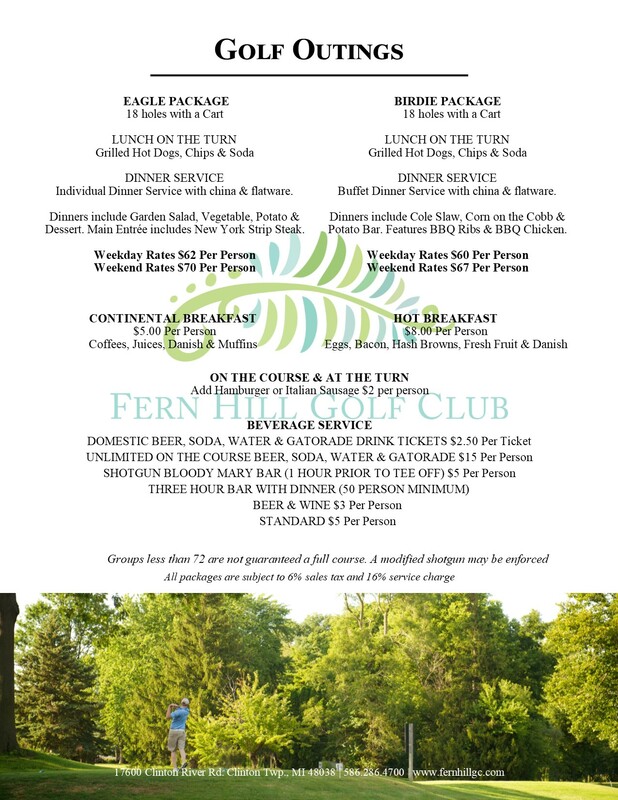 Come and see for yourself why Fern Hill has quickly become a popular destination for golf course weddings in Michigan. Our 18-hole golf course is the perfect fun and casual setting for any golf outing in Clinton Township. As an avid golfer, you can probably play 18 holes just about anywhere, but you shouldn’t have to. At Fern Hill, we firmly believe that our golf-lovers deserve the best. That’s why the Fern Hill Golf Course offers convenient amenities like food, drinks and entertainment, and is conveniently located in the heart of Macomb County. So, if you’re wondering “which golf courses near me” offer the best all-around experiences for golf outings big and small, look no further than Fern Hill. Also, be sure to check out our regularly updated specials for golf outing packages to fit groups and budgets of all sizes. friends, co-workers, or clients, come for the game, and stay for everything else that Fern Hill has to offer. For example, after working up an appetite on our 18-hole golf course, check out Floodz Bar and Grill. Here, you can grab a bite to eat or relax at our full bar while enjoying one of our many drink specials. Speaking of specials, we offer on course beverage packages as well as complete dinner packages for outings and other events. To schedule an outing or league or to join one of our house golf leagues call us at (586) 286-4700.